RCB CORING, BIT #1: Although the penetration rates are relatively slow (with some faster intervals) and recovery is about what is expected, hole conditions appear to be reasonably good. The hole conditions are absolutely critical for us to be able to penetrate deeply, continue coring, and have a good hole for logging, packer tests, and CORKing. The next decision will be to determine when to stop coring with this Bit #1. A basic guideline based on a fair amount of experience (i.e., several decades of scientific ocean drilling) is that RCB bits typically last 40-60 rotating hours in hard rock. Although it’s always possible for a bit to last longer (or shorter! ), the potential exists for it to have a cone fall off after too many hours—we all know too well what that does! One symptom of a bit starting to wear out is a smaller diameter core—this is one thing Bubba and Phil look at very closely for every core recovered. When one of the cones starts to wear out it starts to wobble—this causes a smaller diameter core to be cut. We might also see decreased penetration rates or perhaps erratic/high torque when on the bottom coring (although the latter can’t always be clearly related to the bit vs. the hole). We could always push the bit as far as possible, but we don’t want to do that in a hole we want to deepen, or in a CORK observatory hole where the experiments need to not have metal in them. As of midnight on Wednesday, we had 32.5 rotating hours on the bit (2.2 hrs on the 24th; 15.9 on the 25th; 14.4 on the 26th). By the end of Thursday, we should have ~50 hrs. So, as long as we don’t encounter any problems or see the core diameter decreasing, the general plan is to stop coring with bit #1 around midnight on Thursday. After Bit #1 coring is done, there will be just over 1 day before the next core comes on deck. We have to trip out of the hole to install a new RCB bit and head back down. We also may have some hole cleaning before we pull out and/or when we go back in. RCB CORING, BIT #1.v2: After recovering Core U1383C-14R, we started cutting Core 15R. After seeing some increasing and consistently higher torques, and after cutting the 1st meter of Core 15R, the drillers decided that we needed stop coring and try to improve the hole conditions (wiper trip!). 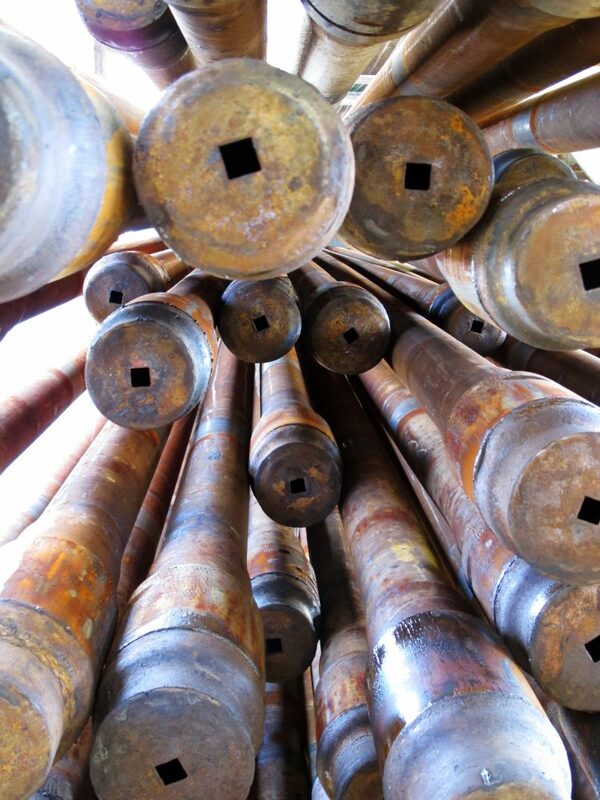 The drillers think that the cuttings are collecting at the top of the drill collars where the outer diameter of the pipe narrows down to drill pipe (see the figure below). If the cuttings continue to accumulate, the friction builds up and, if not reduced, eventually can cause the drill collars to be become stuck in the seafloor (not good). What causes problems in keeping the hole clean? One factor is the changes in the diameter of the annulus of the hole (between the outside of the drill string and the inside of the hole). These changes disrupt the flow of cuttings up and out of the hole. When too much of the cuttings collect, they can prevent the drill string from rotating or being able to pull the drill string up. The pink stars on the diagram are places where there are changes in ID/OD of the hole and where cuttings might collect. One of the big changes is at the top of the drill collars where we go from a smooth, 8.25-in OD drill collars down to various sizes of smaller pipe. All of those above also have upsets (are NOT smooth) so they can land easily onto the rig floor elevators.